The market of software engineering is extremely dense. While there are a lot of companies hunting talent, the number of job-seekers is skyrocketing as well. Laravel service provider job offers don’t come across as often as those for Symphony or Java engineering. If a freelance Laravel developer is set out to have a job with a satisfying Laravel developer salary, a strong CV is crucial. The knowledge of PHP. A developer can be considered an expert if he has over 5 years of working experience of PHP (5x – 7x). Laravel experience. Over 3 years of experience would already be enough to get a decent job. A strong command of HTML, Java, and CSS. The understanding of PM frameworks – Agile, Scrum, Waterfall, etc. Working experience of handling APIs, a knowledge of RESTful or SOAP. The understanding of OOP and model view controller. Seeing that one of the main application of Laravel is the development and maintenance of web applications. HRs look for coders capable of enabling new features on websites and WPAs. Let’s take a look at some tools that will help you brighten up the Laravel Developer CV. Talk. It’s no secret that continuous customer support is something all businesses are currently looking for. So, it’s a good thing for a developer to know how to manage chats or messages into your builds. Talk does just that: other features include conversation tracking, real-time messaging, and message threading. Laravel Test Tools. This tool might not be much talk about when answering an HR’s question. Yet, it helps developers optimize their workflow. As you code, Laravel Test Tools allows you to test your builds. Eyewitness. Laravel Eyewitness is a must-have too. Mentioning it in your resume will prove that you know the technology you’re talking about, Mostly, Eyewitness is used for monitoring queues to see if they are getting backlogs. Laravel is a complex framework that, if used right, can have multiple application and perform almost any purpose you can think of. If you want to take the most out of it as a Laravel service provider or hire a software engineer who knows what he’s doing, the knowledge of the following framework features is essential. The overall architecture of the framework. While Laravel is known to be presented to the public as a few time simpler version of PHP, it’s still a complicated framework. An experienced PHP developer has to perform a ton of complex tasks on daily basis: routing, creating eloquent models, middleware, developing blade templates and views. Neither of this is possible without having an understanding of the architecture of the framework. Using Laravel features for edge-touching development. A well-trained Laravel developer knows how to use the framework features to create Laravel project with a development package. A software engineer can think himself skilled if he has a working knowledge of: Modular Packaging System; ways to reach both global and local databases; codes and expressive syntax. Unit Testing. Unit Testing is one of Laravel’s most basic and functioning features. In a nutshell, unit testing allows developers to test a code while writing new ones. Thanks to unit testing, the development process wins in accuracy. To work independently as a PHP developer, knowing one language brilliantly is not enough. If you want to compete with top-notch SEs, consider putting some time and effort into learning a few extra skills. Understanding other frameworks. Working in Laravel, you might feel like there’s no need to learn other skills. As a PHP developer, you have to have a strong grip on a few other popular frameworks: Zend, CakePHP, Symphony, FatFree, etc. Client-side scripting. Regardless of how many job offers you scroll through, almost each of them lists the command of Java, CSS, and HTML. While using PHP most of the time, Laravel developers need an understanding of client-side scripting done mainly in the three languages mentioned above. The command of Linux and the command line. The knowledge of LAMP stack and Linux distributions will certainly be a strong point in your resume. Networking. Developers can’t work alone even if they wanted to – there’s always a need for collaboration with fellow SEs, designers, and system admins. So, hires with strong networking skills are just as welcome as those with huge technical backgrounds. It’s not that easy to find a job opening for a Laravel developer per se: for that reason, candidates need to know the language itself well enough. Laravel developers mostly work on business websites and CMS. In order to boost portfolio and development skills, Laravel developers use tools. A few popular ones are Talk, Laravel Test Tools, and Eyewitness. If you’re a Laravel developer set out to get a top job, make sure you have a few extra skills – the command of other PHP frameworks client-side scripting languages, Linux and the command line, as well as overall networking and communication capacities. 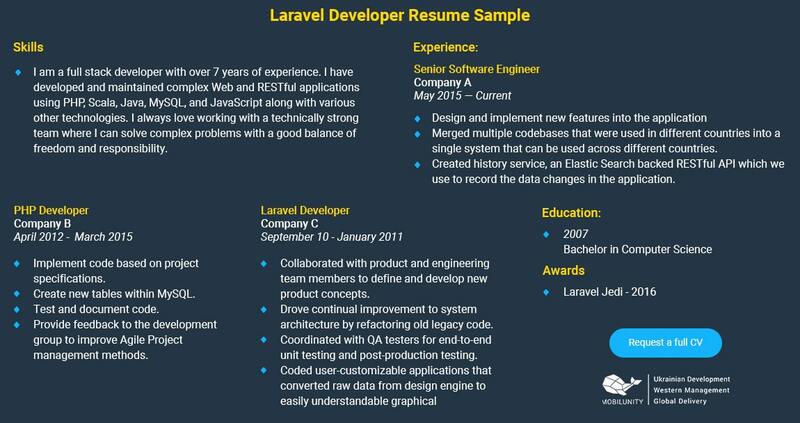 Want to get the perfect Laravel developer resume for your project? Contact us!